Education is more than paper, pencils, and books. A comprehensive education also helps children through the wonderful, yet sometimes challenging, process of growing up. At Springfield Elementary, we provide our students with opportunities to explore new realms in learning, experience the arts, and in developing their own interests and talents. 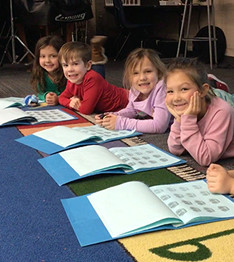 In music class, we introduce students to the basics of music as they learn to feel the beat, keep the rhythm, hear the melody, and sing from the soul. We invite you to attend our upcoming Springfield Elementary Music Program concerts. The community choir gives students the opportunity to expand their performance and music skills and meet other members of the community who enjoy singing. Students learn how to play an instrument and perform as an ensemble in the community band program. You will be amazed at how quickly they learn and improve when you see them perform and participate in concerts during the year. Check back later for information about this program. Sixth grade students learn leadership and gain responsibility in the safety patrol role. Patrol members ensure their peers walk, but not run, to class; engage in positive social interaction, become a presence to prevent bullying incidents, and set a good example for others to follow. Our Student Council does many things to help organize and lead school activities. They are able to participate in the Homecoming Parade, take pictures for the Walk-a-thon, organize materials for Red Ribbon Week, make announcements at school, and help with the Talent Show. The yearbook is run by Mrs. Corbett. This is her first year putting the yearbook together, and we are excited to see her great work! Students may be a part of the yearbook committee during the second semester. Forms to order a yearbook will be sent home in January, and due in March.